Injection machines produces mold plastic item. Molded plastic is injected inside cast, where is cooled. When it is solid the cast opens and the item is rejected. Usually it is left to drop down. Robotic arms can installed to “serve” the machine. Their role is double. First they take the items away and they can place them in order ready for packaging or further procedure. Their second role is to insert printed plastic film inside the cast before the plastic is injected. When this is done film is attached to the hot plastic keeping the print. 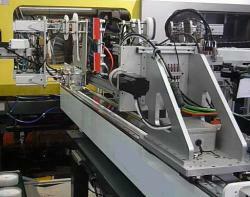 Injection machines needs minimum dead times between injections. Mechanics are very light but still rigid accelerations are close to 5g and speeds above 5m/s.